NASA has suspended science operations with the Hubble Space Telescope and put the observatory into protective "safe mode" while engineers troubleshoot problems with one of the spacecraft's three remaining gyroscopes, used to help aim the telescope and keep it locked on target, officials said Monday. Ken Sembach, director of the Space Telescope Science Institute at Johns Hopkins University in Baltimore, said the Hubble team is optimistic the problem can be resolved. "I think people are just taking a wait-and-see attitude," he told CBS News in a phone interview. "The one thing the Hubble team has shown time and again is it's resilient, and the observatory is very robust to these kinds of things. We typically figure out what's happening and figure out an appropriate course forward. "I don't think anybody is worried-worried that the mission, say, is coming to an end, because it's not. But we may be out of commission for a short period of time here while we understand this and figure out what is the right path forward." Launched aboard the shuttle Discovery in April 1990, Hubble is one of the most scientifically productive spacecraft ever built, generating a steady stream of astronomical discoveries and iconic photos familiar to millions around the world. NASA hopes to operate the telescope into the early 2020s if not longer. It is equipped with six sophisticated, high-speed gyroscopes to help it move from target to target and to provide data needed to keep the telescope solidly locked on while its cameras and spectrometers collect data. But only three gyros are needed for normal telescope operation with the others held in reserve. Three of the gyros are older models that have a history of trouble after 50,000 hours or so of service. The other three are newer-generation models less susceptible to those mechanical failure modes. Engineers believe they could operate for several hundred thousand hours. In the wake of the fifth and final space shuttle servicing mission in 2009, two of the older-generation gyros failed, one at a time, leaving Hubble with just four operational units. This past Friday night, Hubble was operating normally with two newer gyros and one older model. The third newer unit was being held in reserve. "Three of them were on and one was off," Sembach said. "One of the (older-design models) that was on has been acting kind of flaky for a year, and we've expected it to reach its end of life. And, in fact, that actually happened on Friday night. It finally gave up the ghost and failed. Everybody said OK, no big surprise, we've been expecting that for a year, let's turn on the gyro that was off at the time to get back onto science operations." But that gyro experienced problems earlier in the mission, exhibiting unusual "noise" in its electrical system. Engineers later developed a software patch to restore normal operation, but the gyro was kept in reserve. Over the weekend, engineers attempted to bring it on line. "So we turned it on as planned and the gyro was not reading the rates the way it should," Sembach said. "The gyro thinks there's motion occurring when, in fact, there isn't. And so, that appears to be an issue that we don't understand fully at the moment. The noise in the system now with that gyro is such that it cannot be used to point Hubble." 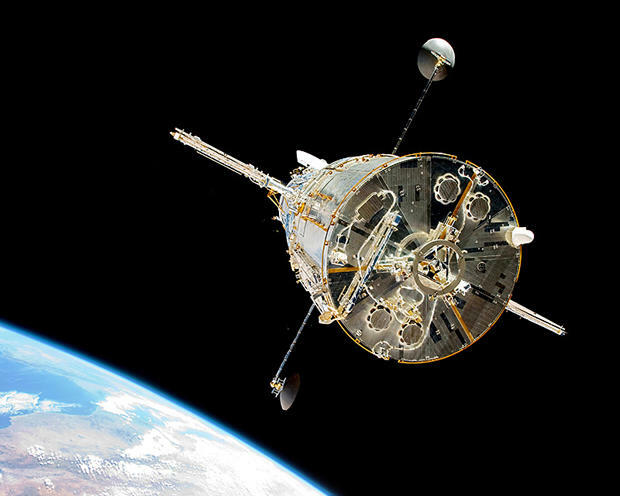 With the shuttle fleet retired and no chance to make any additional repairs or upgrades in orbit, NASA earlier developed "control laws" that would allow Hubble to operate with two gyros or even just one. If it eventually comes to that, the plan would be to skip the two-gyro mode and go directly to single-gyro control to preserve the life of the remaining unit. But Sembach said that's not yet being considered. Instead, the team opted to "put the observatory into a safe-point mode that it could stay in for ages if it needs to while an investigation occurs." While optimistic the problem can be resolved, he said Hubble can operate in near-normal fashion with just one gyroscope if worse comes to worse, although it would be more difficult to track fast-moving targets. "So things closer in in the solar system than, say, the orbit of Mars, that would be more difficult," he said. In addition, Hubble would have to rely more on its star trackers and magnetometers to determine its orientation and aiming, effectively reducing the amount of sky it could "see" at any given moment. "That doesn't mean we can't see the whole sky at some time during the year, we can," Sembach said. "It just might be if we have to look at a particular region of the sky at a particular time Hubble may not be able to point there because of that extra restriction when we're in a reduced-gyro mode. Otherwise, it's good."